Daphne: Townhome for Sale - 2 Bedrooms + Loft, 2 Bathrooms, just steps from community pool! Daphne: Daphne 4 Bedrooms 3 Bathrooms kitchen with new tile backsplash & stainless appliances, fenced yard! Daphne: Daphne 4 Bedrooms + Office, 2.5 Bathrooms 2.5BA, Fenced Yard! Daphne: 4BR + 2Bathroom home in Dunmore - covered porch & new fence. Fairhope Schools! Daphne: 3BR + 3Bathroom home in Dunmore - Fairhope Schools! Daphne: New Price: $25,000 Reduction on Daphne 4BR 3.5BA CUSTOM home with upgrades galore! SOLD! Olde Towne Daphne - 5 Bedroom +Office, 4 Full Baths, 3 Half-Baths, w/POOL! You must see this home with completely remodeled kitchen, stainless appliances, Tile & Hardwood floors - 507 East Oak Ridge Court, Olde Towne Daphne (near Daphne Elementary) - walk to schools, shopping/dining, festivals & the bay! SOLD! Lake Forest 4 Bedroom 3 Bathroom home with Garage. Fenced Yard & High Ceilings - 202 Rolling Hill Dr.
SOLD! in Timber Creek: 8196 Pine Run, Daphne, AL Home for Sale 4 Bedrooms, 3.5 Bathrooms 2,790 SqFt - $415,000! SOLD! Daphne Custom Home in Austin Brook (Comm. Pool & Tennis) 4BR + Bonus 2.5BA - must see! Click here. SOLD! 4 Bedrooms + Bonus Room w/POOL! Two-and-a-Half Baths, Seperate Dining Room w/Stainless Appliances on large lot with 16x16 work shop, must see! SOLD! Olde Towne Daphne 4BR 3BA Custom Home! SOLD! Brand-New home in Beau Chene, (Malbis area near new malls) gated community, 4BR + Bonus Room, 3.5BA, must see!! SOLD! in Timber Creek: 30430 Middle Creek Circle, Daphne, AL Home for Sale Beds: 4 Baths, 3 Bathrooms 2,790 SqFt - $360,000! ONE ACRE in WOODLANDS of Malbis! SOLD! Daphne - Historic Malbis 3BR 2.5BA - found & closed in FORECLOSURE! SOLD! Daphne Home with POOL!Spanish Fort Schools, in Plantation Hills (Spanish Fort schools!) MUST SEE!!! The city of Daphne likely dates to the middle of the 16th century with some historical evidence dating to 1557, and the city holds onto it's history with a quaint & historic area known as 'Old Towne Daphne' while also rapidly becoming a center of business & commerce. Daphne boasts a location on the shores of Mobile Bay with marinas & beautiful, natural bayfront parks. Daphne is also strategically located across the bay from dowtown Mobile, with 2 exits on Interstate 10. Daphne also boasts golfing with Timber Creek & Lake Forest Golf Courses, Shopping & Entertainment with Rave Motion Pictures, the Jubilee Center Shopping Mall & Daphne Bayfront Park. The largest neighborhood in the state of Alabama, Lake Forest with over three thousand property owners. New subdivisions of Historic Malbis, French Settlement, Sehoy, Bellaton & many more continue to rise in the former corn & cotton fields of Daphne. 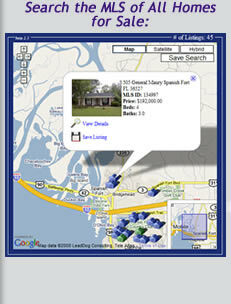 If you are looking to buy or sell a home in Daphne, Alabama, we have a complete listing of homes and lots for sale. You can even search the MLS right here online, free. Has your family outgrown your current home? Are you a first time homebuyer? Michelle Beckham can help. Michelle Beckham, an experienced Realtor® and Agent of ERAClass.com can guide you every step of the way. Daphne, Alabama "The Jubilee City" is so-named because of the Jubilee that occurs twice a year, when oxygen levels in the Bay decrease & fish, crabs, and all types of sealife literally float to the surface, trying to find more oxygen. Daphne residents take advantage, walking the shore & literally scooping up pounds of seafood with nothing more than a fishing net! Daphne's location on scenic Mobile Bay also afford it beautiful sunset views, great seafood & all manner of water sports from boating & fishing to sailing & skiing. A short drive from the many dining opportunities of the Causeway (Original Oyster House, Ed's Seafood Shed, Blue Gill, Felix's & more), and the tremendous shopping opportunities of the Daphne Jubilee Center & Malbis's exciting new Eastern Shore Centre. Not to mention Daphne's own Mardi Gras parades, proximity to Fairhope's quaint downtown district, and convenient location with two exits directly on I10, Daphne, Alabama is the ideal location for your real estate purchase.